A short distance north of Venice is the small Italian town of San Polo Di Piave, home to the band Scarecrown. Fronted by the engaging Antonella, a quick assumption would lead one to believe that Scarecrown is yet another Nightwish clone or possibly even one of the many Gothic metal acts to emerge from Europe lately. Neither comparison applies to this Italian foursome, however. Instead, the band opts for a modern metal sound on their debut demo 'Til The Last Breath that is similar to Godsmack or Sevendust, though with a slightly darker ambiance about their sound. Antonella is a capable frontwoman for this band's style, with a seductive voice that she rarely takes to operatic ranges. When she does, particularly on occasion during the leadoff track "Pathos X", she's obviously leaving her comfort zone and struggles with the higher notes. This makes for only a minor complaint since the forays into her upper range are infrequent. Instead, Antonella delivers the lyrics in a powerful, mid-range voice that blends superbly with the heavy mood of the album. There are short bouts of harsh male vocals to compliment Antonella, with a bit of a Gothic croak on "Pathos X" and a few Deathish growls during the choruses of "Suddenly". Co-founder Andrea "The Ogre" lays down a series of modern, mid-paced riffs throughout the album that are deep, chunky, and dark. 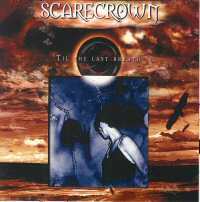 Very much in the contemporary style that is a favorite of "rock radio" these days, they lend a familiar feel to the 5 tracks on 'Til The Last Breath. "Suddenly", my favorite track of the demo, marks a change in mood for the darker and sees Andrea increasing the weight and impact of his riffs. Lending extra doominess to the crushing, groove-infused riffs are the heavy bass lines from Simone. Taking a page from the heavy doom of bands like Candlemass and Cathedral, the strangely titled "Playin' With a Swindler" is also a gloomy highlight of the disc. Scarecrown doesn't offer anything innovative on 'Til The Last Breath, but they show a skill for creating memorable music with big, catchy riffs and well-placed time changes. I feel that their best work comes with the last two songs on the album, rather than the contemporary sound they achieve on the first three. A talented band, whichever direction they choose to pursue.